Best viewed on Adobe Acrobat 9 Pro, Apple Preview, and PDF Expert (iPad). Since the 1970s, when historic monuments were first granted legal protection and the first shophouses were rehabilitated, architectural conservation has evolved and taken root in Singapore. Heritage buildings form a significant part of our urban landscape today, as brick-and-mortar repositories of memories straddling generations and as treasured focal points for diverse communities. In the early days, the main challenge was overcoming the prevailing perception of these historic buildings as crumbling, unsanitary and inefficient structures worthy only of demolition (though in need of rehabilitation, they are embodiments of artisanship, history, and urban character). Another uphill battle was the polarized view that conservation is a zero-sum game in terms of economic growth and urban development (it is an indispensable component in all creative, dynamic, well-loved, liveable and competitive cities). With growing appreciation and awareness of heritage, many have since come around to the idea that conservation is not about fighting change but about how it is managed. Across the city, historic neighbourhoods have found a new lease of life as places to live, work and play, and a growing number of national monuments have been carefully restored in recent years. While much progress has been made and lessons learned in the past four decades, there is still much room for improvement in skills and knowledge of best conservation practices. This guide is intended to help bridge this gap by laying out the ways to identify and appreciate heritage attributes, understand historic materials and assess their condition, as well as the methods and principles of restoration and long-term maintenance. 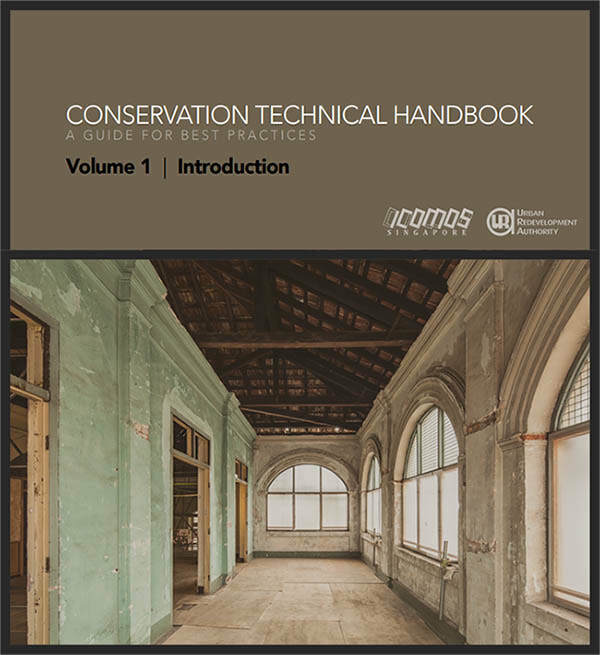 This introductory volume touches on key historic building types and materials found in Singapore, and gives an overview of common deterioration phenomena as well as assessment and restoration approaches. There is a summary of the local regulatory context and different categories of conservation gazetting. A brief look at the key international heritage charters and principles provides reference for how conservation thinking and ideals have evolved and matured on the worldwide professional platform. Finally, a handy glossary of common terms is included to dissect and clarify concepts such as ‘reinstatement’ (for specific missing elements) or ‘adaptive reuse’ (where the building is remodeled to accommodate new functions). Subsequent volumes go into different aspects of a heritage building, such as the roof, façade, structure, doors and windows, interiors, services, and building coatings. Built heritage can be seen as a public good, and every stakeholder – including the owner, developer, authority, building professional, builder and user – serves as a custodian of these precious assets. There is shared responsibility to safeguard each historic structure and ensure its safe passage onwards to the next generation. This series is conceived to provide guidance along the way.